2. I found this place so enjoyable and great in value I almost want to keep it to myself. But as a small business- and one owned and run by residents from abroad at that- the right thing to do is show support! I've long known about there being an international area near Dongdaemun that goes by many names: Little Russia, Central Asian Village, etc. 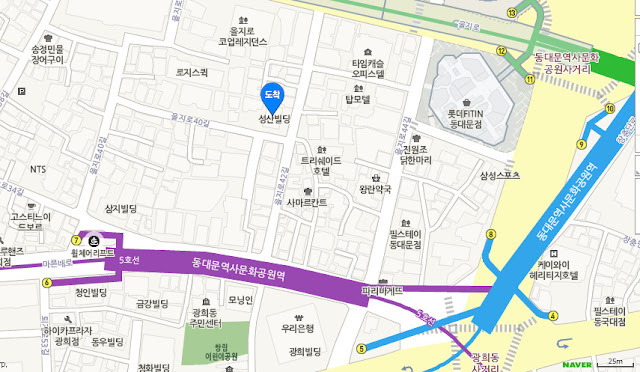 But being unfamiliar with the food of this region and not really going to Dongdaemun much in general, I never really sought this little pocket neighborhood in Gwanghuidong out. Since I now pass the Dongdaemun every weekday after work on my way home, I met up with a university friend near here who also enjoys trying new things and we decided to visit Samarkand City. There's actually a chain of Samarkand restaurants around Korea with a couple in this neighborhood and Samarkand City seems to be one of the newer branches. Except the flashing neon lights of the mega-shopping structures, the commerce-focused Dongdaemun area has always had a bit of a drab feel to it and though Gwanghuidong is no exception upon entering Samarkand City you can't help but gape at how colorful everything is. The woven tapestry-like table covers looks almost like glow-in-the-dark pieces with its vibrant colors, even with the glaring white light. And look at how nice the teapot holding the complimentary tea looks? No plastic, curved water bottles here with soju ads plastered on them. Immediately the setting, tableware, utensils and all gives you a very out-of-Seoul feel. The owner/server(?) guy was super friendly and very accommodating, taking the time to explain the different dishes and offer his recommendations. He even offered their carrot salad as a service. I've heard about various carrot salads being used in this region and even Koryoin, ethnic Koreans who were sent off to the Siberias and other regions around here, making a makeshift kimchi out of carrot. I was surprised by this carrot salad (3K) with its garlicky, tinge of savory carrot salad with a bit of natural sweetness from the carrot. I've never thought of carrot as a vehicle for such a pickle-like dish but surprisingly it works well! But then I recalled seeing pickled vegetables in the past with chunks of carrots in it too. I must say though the sort of julienned carrots act as a much more pleasant taste and texture for pickling. It came in wonderfully later as a balance against some of the richer, meatier dishes later on. The carrot salad was much more intriguing than the regular "fresh" salad (3K) comprised of seasoned thin onions, cucumbers, tomatoes which were perfectly fine but not as interesting and personally appealing as the carrot salad. This sauce was provided on the side which, admittedly, I'm still unsure of. It had a peppery ketchup taste to it but moreover, I wasn't sure what it was for. For our main we picked three choices including a rice with beef (plove, 8K), which came recommended both on the menu and by the friendly owner. Seasoned rice, cooked carrots, garbanzo beans, and cuts of beef is what makes this dish which is even described on the menu as a sort of "deopbap". While the rice had a nice seasoning from its simmering in broth which was complemented by the sweet carrots, the beef was rather dry. I have no basis of comparison for how this dish generally is but it was an average dish for me only because of the dry beef. I'd be happy with the rice on its own but as a main with the beef, it was just a bit underwhelming. However, the beef rice dish was the only minor disappointment as the rest of the menu, carrot salad included, was quite wonderful. The samsa (3K), related to the beloved samosas in Indian cuisine, is different from its cousin as here it's baked. Within the beautiful, flaky crust holds a potpourri of minced meat, vegetables, and seasonings. Just as mandu (dumplings) are sold as a snack on the streets in Korea, I've heard samsas are the same in their native regions and I could see why. Nicely seasoned minced meat and vegetables held within a flaky, buttery crust is a combination that I'm sure you'd be hard pressed to find anyone who doesn't like. But the real star of the meal, and one that I still fondly recall, is the mutton or kazan kabob. We were really drawn to the dish particularly because of the eye-raising low price of being only 10K! Lamb/mutton is not the cheapest nor easiest meat to find in Korea and to see it so inexpensive I was on the fence but went with it after the owner gave his thumb of approval as well. Two big cuts of lamb, three cooked potatoes, sliced and pepperd onion atop comes swimming in a clear broth. Admittedly it isn't the most exciting looking dish there is, especially in comparison to the colorful decor of the restaurant, and I was initially quite skeptical as I know lamb without a lot of spices (like in western Chinese dishes) or sauce (like mint jelly or garlic in Western dishes) can give it quite a gamy flavor. But my, oh my. On first bite I was hooked with the oh-so-soft texture giving into the nice meaty flavors of the lamb that's still incredibly moist. The menu specified that the the lamb is fried then baked which, I don't know if that's the secret, but the lamb is just so surprisingly moist and flavorful. And at 10K for this dish, it's a real steal. My friend and I kept remarking on this dish as we dug in and picked it clean to the bone. Being unfamiliar to Uzbek cuisine, I can't compare Samarkand City in that regards. As a mere passing-by diner, however, I can't say enough about how wonderful I found my experience here. The decor was beautiful (and colorful), the service was super friendly, the prices were extremely affordable (truthfully, I found the prices too low! ), and the food overall was tasty, if not (dishes like the lamb) outright delicious. Come out of exit 12 of Dongdaemun History and Culture Park and walk straight for about 75m until you get to Euljiro 42-gil and turn left. Walk about 50 meters and you'll see Samarkand City on your right on the second floor. Korean soju, beef available as well as Russian beer (Baltika) and vocka available. There's actually a range of Samarkand restaurants in this vicinity which, I believe, are all under the same ownership. I opted for Samarkand City.